Goodmorning people!! How are you today? I started writing this post on wednesday, but I haven't really been in the mood for writing or posting anything and I'm sorry. Tuesday night I watched "Carnage", directed by Polanski and I just can say... wow! 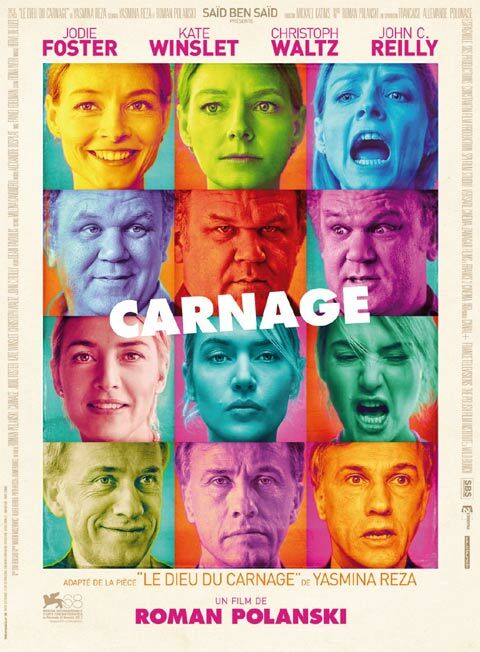 I was pleasently surprised by this movie, it's not the usual predictable movie, it was different and funny. Christoph Waltz makes the whole movie even better, he's such an amazing actor and now I can say I've seen him without pants, it's a dream come true (and I'm just kidding ahah). The movie was really awesome and I don't want to write too much and ruin it for those who are planning to watch it (actually I don't know what to write about it, the only things that come to my mind when I think about it are "WOW!" and laughter), but I can honestly say you should watch it, it's worth the money and the time. I haven't done much in these days, mainly school, friends and watching "Le fabuleux destin d'Amelié Poulain", my french has improved a lot, actually. Love that movie, if you haven't seen it yet, watch it NOW!! Hope you are going to enjoy the movies, and I think you will!